and disappear on all the parts of the body. 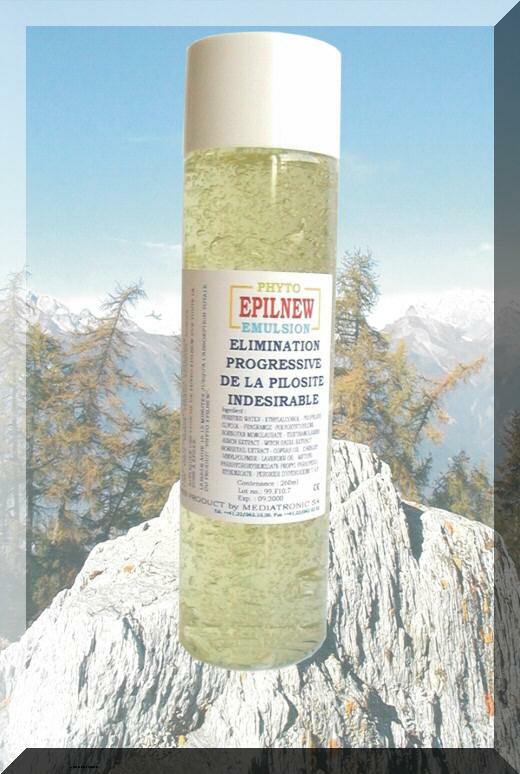 Epilnew is an active emulsion phyto gathered in oils essential and extracted from plants. The originality of Epilnew is to quickly atrophy the root of the hair by a biochemical natural action, in the short and medium term the disgracieux and undesirable hairs are refined and disappear on all the parts of the body. Can one use Epilnew for the treatment of the beard? Yes According to the pilosity of the face, stronger in the Mediterranean countries, to apply a layer of Epilnew 3x per week during several weeks, this will allow a reduction of shaving and a refinement of pilosity. It however is recommended not to apply Epilnew to the beard during several months, to avoid a quasi complete disappearance of the pilosity of the face if it is not wished. Can one apply Epilnew after a meeting in the hairdresser? Yes. It is known since always that after a meeting in the hairdresser, the hairs of the nape of the neck push back very quickly and firmer by shaving. While applying Epilnew to the nape of the neck, the hair will be refined, its being pushes back slower and will disappear in the short or medium term. Can one use Epilnew at the time of treatment wax? Yes Considering the atrophying characteristics and antibactériennes of Epilnew, the combination is ideal. No the pain, the refinement of the hair and the meetings are spaced more and more. Yes Epilnew is a good complement for this kind of treatment. The results will be elected fast, the duration and the number of meetings definitely decreased. Can one treat all the parts of the body with Epilnew and at which age? Yes All parts without exception, face, armpits, shirt, legs, arms, backs and parts intimate and at any age. Can one use Epilnew for the treatment of the undesirable hairs of the sexual parts and in the line of the buttocks? Yes the extraction of the hairs on these parts of the body being painful, Epilnew will allow a progressive and durable atrophy, supporting an easy extraction and without pain with the conventional methods. Can one use Epilnew on the head? Yes In so far as one wishes to maintain a baldness in the short and medium term. Can one treat all the hairs with Epilnew? Yes Without exception all hairs whatever the color and the type. Can one use Epilnew to treat the hairs of the nose and the ears? Yes To apply a light layer to the places to treat 15 min. and to extirpate the hairs using a tweezers. Does Epilnew preserve the glare and the beauty of the skin? Yes Thanks to its good properties disinfectants and hydrating, the glare and the beauty of the skin will be improved. Double-click to return at the beginning of the page. Copyright © 1996-2019 Mediatronic S.A. All rights reserved.